Sinn Féin President Gerry Adams MP MLA, Party Chairperson Mary Lou McDonald MEP, and Conor Murphy MP MLA, Minister for the Department of Regional Development, are in London this week for a series of meetings. The meetings are part of Sinn Féin’s strategy to advance its goal of Irish re-unification. Sinn Féin is embarking on a more active engagement with those in Britain who support Irish unity and is seeking to produce a renewed strategy able to advance republican goals. “The Irish people have the right to independence and self determination. Partition will end. Irish reunification will happen. “Irish unity makes sense. Political sense. Economic sense. And it is in the best interests of the great majorities in Ireland and Britain. 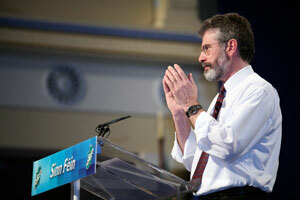 “The Good Friday Agreement provides a legislative, peaceful and democratic route to achieve this. And the economic and demographic dynamics in Ireland make Irish reunification a realistic objective within a reasonable time scale. “We need your support and the support of the Irish in Britain, as well as of progressive forces in Britain to achieve this. “Tonight’s event is I believe an important first step in opening up a debate in Britain around the goal of achieving Irish unity”.